Be prepared for the Raccoons and tons of fun! Beautiful lake with several nearby places to rent boat's! Beautiful, peaceful campsites with a lot of shade! Wonderful campground with awesome people! Campers should know that camping here will provide you with wonderful, shady camping and several hungry raccoons! On the website it shows this campground to be permanently closed. The cleanest campground we have been to in our neighborhood! Easy to get to, however some of the worst roads I have been on. Turkey Run is one of my top 2 campgrounds in Indiana! We camped here during the Covered Bridge Festival, which is really hard to get a site, book early if you're wanting to do that. We went during the week so it was easier to get a campsite. Our site, 226 was on a small loop that was nice and wooded. The campground staff was really good at keeping the noise down, we've had problems with noisy campers before so that was nice to see. My absolute favorite part though, is the trails. You completely forget you're in Indiana. We went on trail 5 I believe which ran through a creek bed for awhile and that made it even more fun. We normally have our kids (4 and 1.5) but were kid free this time. We wouldn't have been able to take them on this trail at this age. If you're into kayaking or canoeing, there are several canoe liveries that service the area and a trip down Sugar Creek is always a good time. Put this one on your must see list! We were here this past July the campsite was perfect! It was in loop plenty of room for us. The showers and restroom were very clean considering as busy as it was. Hiking were beautiful trails. We enjoyed it so much going again next year!! This is one of our favorite camping destinations! The park and facilities are clean, and the trails and scenery are out of this world. It is very beautiful there in the fall! We had terrible cell reception, but I enjoyed that “issue”! The campground is generally very full, so I would consider it a good place to get together with others, not a place to go if you need to get away from it all. We enjoyed the canoeing. The bathhouses could use some attention, but are definitely not the worst! We did have cell reception while staying there. There are playgrounds available to take your children to play on. Beautiful trails with a variety of challenge levels. Many great sights to see and very well maintained. We loved the bridge across the river. We visited during the weekend and it was not overcrowded. The did not get any cell service or internet while there, so be aware if that's important to you! Nice lake for boating and fishing, great for bike riding. Campsites have really nice fire ring with grates for cooking as well as picnic tables. This was a great little camping place, right next to the Wabash river! With the rain we have experienced recently I was prepared for a little mud with a few extra tarps on the ground and it was perfect! The view was great of the river and we cooked chili over an open fire in the fire pit, great place to spend a couple of days or longer! Nice quiet campground with spacious sites. Canopied by the big beautiful Indiana trees. Close to some good hiking trails. What a great time we had. This park had everything you could want. The sites are spacious, wooded and all have 2 picnic tables. Inside the park are blacktop trails for hiking or bike riding. They also have walking trails. Nice and relaxing campground. Modern bathhouse, three large playgrounds and shelters to use. There is lots to do here! I came here earlier in the summer for a day of hiking and really enjoyed it. We hiked for hours and only covered a small protion of the trails available. There are so many nice spots to take in the views. Its dog friendly but some trails have steep parts with ladders so you'll have to keep to the more shallow trails. The trails can also get full of people during the midday and early afternoon so get out early. I can't wait to come back amd explore all there is to see. Nice campground to visit,decent sites and close to turkey run for tubing, canoeing,hiking,etc. We had an amazing weekend camping at one of the non-electric sites. Our site was right next to the lake, which was awesome for the kids. The grounds were very clean and the sites had plenty of space. The only drawback for us was having one shower stall available in the Men's and Women's restrooms in the non-electric area. There is just one thing that keeps me from rating this a 5 star campground. It's the sites! So….4 stars…but read on for my thoughts on the sites. What's up with these sites? If you want to be be able to see what your neighbors are eating and hear their conversations, you'll love the electric sites (1 through 189). If you like to feel like you're alone in the woods, you won't like most of the electric sites. There is a partial solution. Sites 190-202 have no electricity, but most are fairly private/secluded. Sites 203-222 are additional primitive sites on a loop but they are not at all private; you can see lots of neighboring sites. There's a lot of shade, but you could probably set up solar panels if you require electricity. If you want privacy in the electric section (1-189), I don't have a great recommendation other than you should stay on the outside of the loops. Then you'll only have people beside you rather than beside and across from you. Good luck! Stay one night when there aren't many people and scope out sites for your next stay. If you're from the area, this could be a park worth returning to over and over if you are able to stay on a site you enjoy. I've included a map of sites 1-189 and photos that show some sites I like and sites I don't like. In my opinion, a site is not one for me if I can see 3 other picnic tables while sitting at the table at my site. If you camp with other families, this would be good because you can make your own 'group' site. Something you need to know: Indiana state parks have a $7 entry fee but you'll only pay it once (unlike some states that make you pay every day). It's supposed to be $9 for non-residents, but we were only charged $7. The hang tag for your vehicle will get you in the main entrance for the rest of your stay. If you come without a reservation: The registration attendant assigned a site to us but maybe you can choose one. Since it was the day after Labor Day and the park was sparsely populated, there was no one near us. Privacy was not an issue for our stay, but we wouldn't have enjoyed our site on a busy weekend…although there were many sites we would have liked even less. The basics: picnic tables, fire rings, dump station, potable water, flush toilets and sinks in the bathrooms, separate shower facility. There are vault toilets closer to sites 190-222. Sites 1-189 have electricity. The full hook up sites are level and private. The state fair grounds are on the outskirts of downtown Indy and not meant for camping. But there are plenty of opportunities for fun activities - from the state fair to concerts, dog shows and more. Electrical sites are not great for tents but non electrical can be a wild party during memorial weekend. Recommend going in the off season if you want to visit. The park is overrun in the summer months and week days in the spring can be overrun with school groups. That being said, we have visited here for 15 years and continue to return and invite friends! The hiking trails are extensive and fun. You walk they creek beds, climb boulders and waterfalls. There is horseback riding and canoes/kayaks available nearby. Also a nice visitor center and historic home onsite. We find Geodes in the riverbed often! sites have chip gravel, clean sites, clean comfort stations. This is NOT a woodsy campground with waterfalls. read the descriptions. Some sites are full hookup. they planted some trees in the prairie area. Spruce trees In the spruce loop are dyIng from whatever Is killing all spruce trees. Bike trails are paved and good for little ones and families. 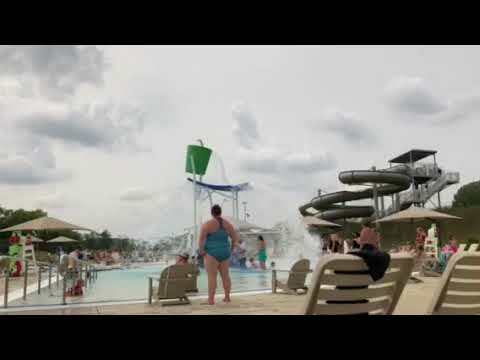 Waterpark is $5.00 and entertains all ages. Haven’t been to the Wolf Park nearby but planning to go. This campground is beautiful, big, quiet, and surprising. There are over 200 sites in this park. We reserved a spot 2 weeks before our vacation. I dont know if it was empty because it was a Tuesday night or if no one knows about this park…..people need to know about it. Each campsite is spacious and has plenty of space away from your neighbors. There was plenty of shade even though our pad wasn't tucked back in the woods. We were right next to the bathrooms which were big (plenty of stalls and showers), CLEAN, and comfortable. There is someone at the gate until 11p.m. After that, I think you have to contact the camp host for entry. Anyway…..the grass was cut, the staff was helpful and knowledgeable, and it's not far from some pretty cute little waterfalls (Cateract Falls.) Oh, and if you camp at Lieber you get free entrance to the falls. We are definitely planning to return for a longer stay. Much less popular than Turkey Run this state park is great for hiking! Many trails lead to gorgeous rocky cliffs, the river and a gorgeous waterfall. Love that it’s much less populated giving you are your crew more space and less noise.